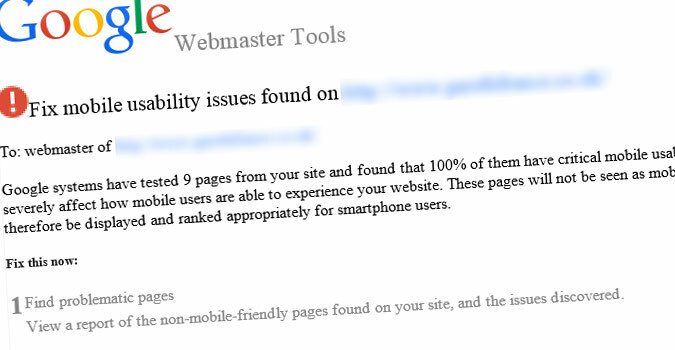 For several months, Google have been sending out emails to webmasters with the title "Fix mobile usability issues found on [your domain inserted here]". In some cases, these can be a bit worrying, because they say things like "Google systems have tested 100 pages from your site and found that 100% of them have critical mobile usability errors". Google warns you "These pages will not be seen as mobile-friendly by Google Search, and will therefore be displayed and ranked appropriately for smartphone users." Which is another way of saying that you're potentially missing out on mobile users, because when they search the web, they probably won't find your site – and they may well find a competitor's. In practice, this means the site wasn't built with mobile devices in mind and so the links are probably too small and too close together for people to be able to click on. And the text is too small to read without zooming in. Theoretically, your site will be missing out on mobile users, because when people search Google on their phone, they probably won't find it –they will find a competitor's site. Don't panic - nothing has changed on the site and there are no faults that need to be fixed as such, it's just that Google has started a programme of sending out emails to the webmasters of sites that are not yet "mobile-friendly". As a major mover in the mobile 'phone market, Google has a vested interest in making the mobile internet experience better for everyone - hence the inflammatory language they're using in their mailout, with words like "fix" and "critical... errors" to scare webmasters into getting up to date. There are simple steps you can take to solve this. Inevitably it will involve an investment in bringing the site up to date but on the upside you'll be improving the experience for all your website visitors and quite possibly increasing sales or enquiries.